"A complete project planning and management tool for your Windows PC." RationalPlan Single is a full project planning and management tool that will provide you with every form and data tool that you will need to properly plan and manage independent projects. While there are other versions of the application that will allow you to do even more, The Single Project version allows you to handle an independent project and you will have all of the tools necessary to do so. You will not, however, have the ability to share resources, link tasks between different projects. These options are available in the Multi Project version. 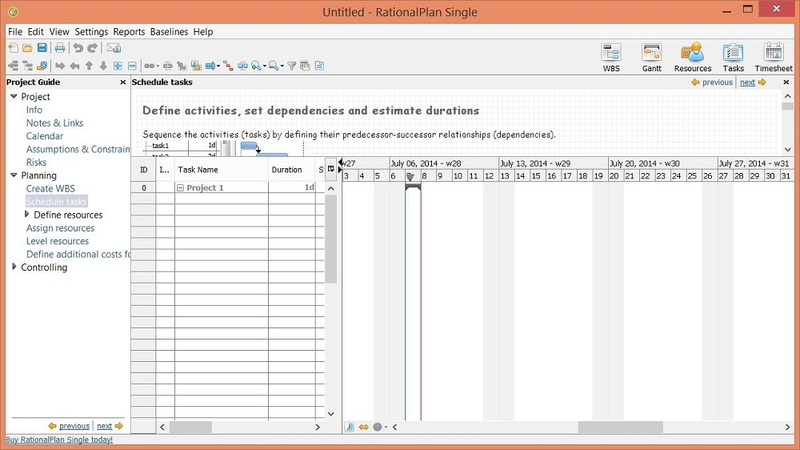 RationalPlan provides you with a great interface for productivity and easy navigation of its features and tools. The interface is very simple and logical. With so many features built into this application, it is extremely helpful that the interface easy to understand and use. The major features of its Project Planning division include the ability to create, edit, and delete calendars, build work breakdown structure, create dependencies between tasks (set lead/lag time), manage task properties such as constraints, fixed costs, etc, and associate general project information such as its name, notes, links, assumptions, constraints, risks, etc. The Project Planning division of this application may very well be the most important and its feature subset definitely pushes the issue as it is rich with content and options. A project planning and management tool would not be complete without a method for managing resources for a project. 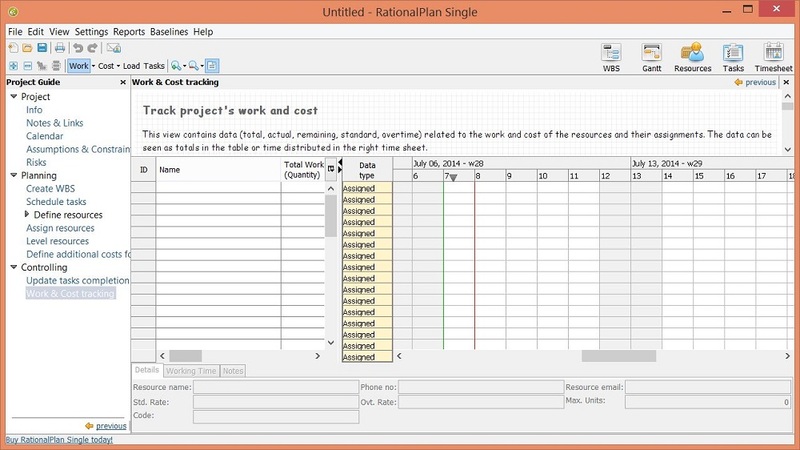 With RationalPlan Single you can define project resources (human/equipment and material), define specific working time and role for each human resource, assign resources to tasks, view timephased information about resources’ work and cost, view overallocated resources and resources that work overtime. And with Project Tracking, you can do even more. 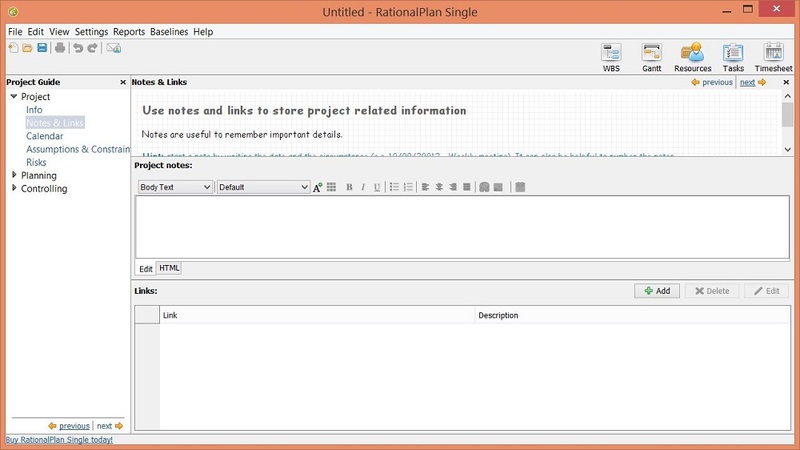 Some miscellaneous features of RationalPlan include: the ability to use Gantt Chart, the Project Guide will assist you with step-by-step, easy to follow instructions and explanations, there is an icon bar with specific commands for each and every view, and there’s no dialog windows unless strictly necessary. RationalPlan makes the process easier than ever before. 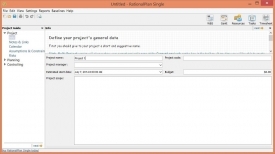 You can even import from and export to Microsoft Project and Excel. You can print reports from your printer or to a pdf formatted file. Best of all, Rational Plan is cross platform. This means that if you have users that have Mac OS X systems or Linux based systems, you can all work on a project together without the need to be on the same type of system.